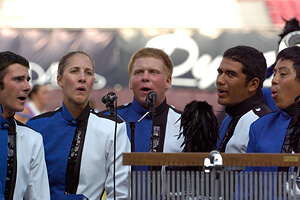 When the 2006 DCI World Championships went to Camp Randall Stadium in Madison for the seventh time, the venue had recently been substantially modernized and enlarged. Prior to the final week of the summer season, all Division I corps stopped at the first-ever DCI Southeastern Championship in Atlanta, and numerous groups were forced to curtail many days of outside rehearsals when a record-setting mid-July heat wave turned most of the nation into a 100-degree sweltering oven. For the second year in a row, Colts were the corps on the wrong side of the "bubble," one corps away from performing on the last night of the season. 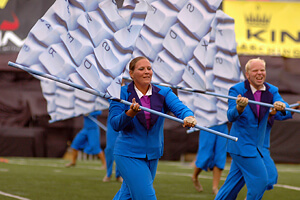 Returning to Division I competition after more than two decades in Division II & III, Blue Stars surged into 14th place. The pack was so close in that range of corps that both Crossmen and Capital Regiment were within .65 of a point from the Blue Stars. Mandarins held on to a Semifinals spot, knocking Southwind out of the picture. Capital Regiment's 16th place show, "Life Rhythms: Work, Rest and Play," explored how our lives are guided and controlled by elements we don't necessarily see, but definitely feel. Each musical selection depicted an aspect of daily life. Prior to the beginning of the "Work" segment, the corps' drum major read the daily paper and glanced at his watch to see if it was time to start the day and earn his living. The opener, Eric Whitacre's rhythmically dense concert band work "Equus," is described by the composer as "dynamic minimalism" and "a piece that starts running and never stops." After leaving work, one member of the color guard jumped repeatedly in glee of being free to go home, but the enthusiasm soon gave way to a needed rest, as some members of the guard stretched out on the field for another Whitacre work, "Sleep." Whether played to the backfield as if in a dream-like trance, or facing forward, the lyrically subdued piece was like a mass sigh, ending with a single flag stretched out to reveal an image of the moon, casting its light upon the sleeping residents of Earth. The final movement of the show was "Play," based on "Serra Pelada" from Philip Glass' score for the 1988 film "Powaqqatsi" ("Life in Transformation"), the sequel to the famous 1982 film "Koyaanisqatsi." Like the earlier film, "Powaqqatsi" (a Hopi term meaning "parasitic way of life" or "life in transition") contained no dialogue. The movie focused on the conflict in Third World countries between the old and new ways of life. "Serra Pelada" was written for the part of the film that explored the conundrum of Bald Mountain, a large gold mine in Brazil that attracted at least 100,000 prospectors when gold ore was discovered there in 1979, but quickly became a ghost town. The corps' take on the music included no such exploration of irony. It was thoroughly joyful and all about the rhythm of the drums. Quite innocently, it celebrated the elation of having free time to blow off steam and enjoy the childlike act of play. A Frisbee was thrown from the right 40-yard line and was caught by a tenor drummer more than 40 yards down field. The sound of Joia Tubes added both a sense of exoticism and playfulness. Joia Tubes are plastic tubes struck by paddle-like mallets to produce a "woomph" sound. Six corps members sang the native Brazilian chant while other members jumped around, spun their instruments and performed other acts of lighthearted goofiness, eventually leading into a drum feature that was topped off by a big, slowly dramatic push to the front. During the final statement, flags swept across the field, emblazoned with the sun rising over the dome of the Ohio State Capitol Building in the corps' hometown. It was time to arise and start the process of another day. For this week only, you can save on the DVD that contains this complete Capital Regiment performance, along with all of the 13th through 24th placing corps at the 2006 DCI World Championships. Buy the 2006 Division I Volume II World Championship DVD. (Available this week only for 20% off. Regular price: $29.95.) Discount DVD offer ends Monday, March 4 at 8:30 a.m. ET.